This lion's mane jellyfish was photogrpahed in Patten Bay in Surry in June. 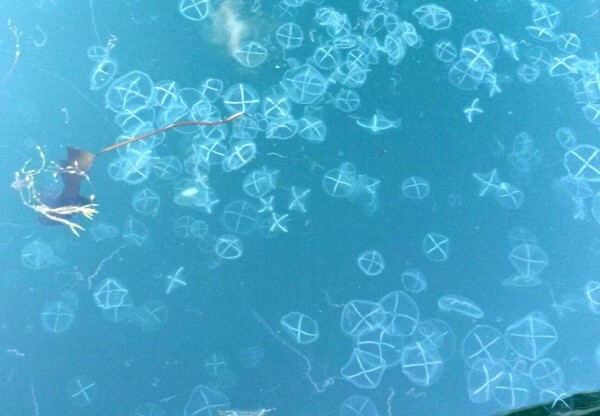 This swarm of white-cross jellyfish was seen in Passamaquoddy Bay off Eastport earlier this summer. A scientist at Bigelow Laboratory for Ocean Sciences in Boothbay says more jellyfish have been appearing along the Maine coast over the past two years. He is trying to get the public to send him photos and information about where jellyfish are being seen. These four moon jellyfish, or jellies, were among several dozen that washed up last weekend on a beach in the Gouldsboro village of Corea. A Maine scientist says large numbers of jellyfish have been seen along the Maine coast last summer and again so far this year. This lion's mane jellyfish was spotted in Spruce Creek in Kittery earlier this summer. 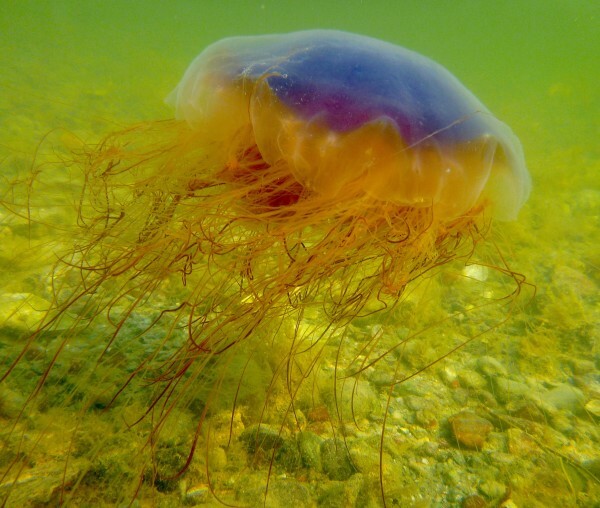 According to Nick Record of Bigelow Laboratory for Ocean Sciences, some Mainers have reported seeing dozens to hundreds of lion's mane jellyfish at a time this summer in Kittery and Surry. This lion's mane jellyfish was photographed in Patten Bay in Surry in July. According to Zoe Weil, the Surry resident who took the photo, this summer "there have been more Lions Mane jellies than I've ever seen in my 18 years living here." One place white-cross jellyfish have been showing up this summer is along the shore in the Boothbay region, often on or in fishermen's lobster gear, according to Nick Record of Bigelow Laboratory for Ocean Sciences. As was the case in 2014, jellyfish again are in large numbers along the Maine coast this summer, leading marine scientists to seek help from the public in keeping track of where they are appearing. Nick Record, an ecologist at Bigelow Laboratory for Ocean Sciences in Boothbay, said the jellyfish are not yet appearing in concentrations large enough in Maine to cause alarm — as they have in Europe in recent years — but the visible increase in the Gulf of Maine is worth tracking. Record said he has received between 100 and 200 reports from the public this summer about jellyfish sightings in Maine and New Brunswick, Canada. Some people have emailed him photos while others have posted photos on Twitter with the hashtag #mainejellies. Record said this summer’s research is an attempt to compile data on sightings for use in a potential, future scientific study about jellyfish in the Gulf of Maine. The Gulf of Maine Research Institute in Portland and the Island Institute in Rockland are partnering with Bigelow Lab in the crowdsourcing data-gathering effort, he said. There are several theories floating around about why the numbers of jellyfish appear to fluctuate. Some have tied the phenomenon to climate change while others posit it simply is part of a natural 20- to 30-year cycle. There also is a “jelly ocean” hypothesis, Record said, which suggests the changing ocean environment leads to more frequent jellyfish blooms. Higher volumes of fertilizer runoff from shore has contributed to decreased oxygen levels in the ocean, he said, and jellies tend to fare better in low oxygen conditions than other marine organisms. Warmer waters, overfishing of predators and even human disturbance of the ocean floor all have been raised as possible factors in the apparent rise in jellyfish abundance. “That is something scientists are debating,” Record said. Jellyfish, often called “jellies,” are not actually fish. They are gelatinous creatures that, according to the National Science Foundation, reproduce sexually and asexually, depending on their life-cycle stage. Jellyfish have the ability to reproduce very quickly, which sometimes results in “blooms” that garner widespread attention. In Europe, a bloom killed more than 100,000 farmed salmon off Northern Ireland in 2007 and another last year off Scotland that killed 300,000 salmon at another aquaculture site. According to media reports, farmed fish can die from a lack of oxygen after masses of jellyfish cut off water flow into their pens or from stings from jellyfish that are small enough to slip through the netted mesh. In 2013, a jellyfish bloom off the Swedish coast shut down a Swedish nuclear power plant when the creatures blocked the cooling water inlet, preventing water from getting inside the reactor for two days. There have been news reports of similar incidents in recent years at power plants in Israel, California, Scotland and Japan. Record said there have been reports this summer of large numbers of white-cross jellies appearing in the Bay of Fundy, leading to clogged stationary fishing weirs in New Brunswick. “It’s basically a jellyfish filter sitting in the water,” Record said of such weirs, which are much more common along the coast of Atlantic Canada than in Maine. 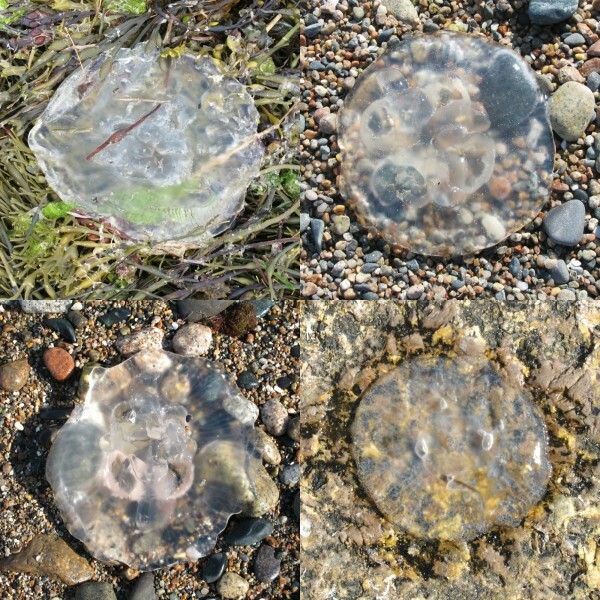 Species of jellies appearing in Maine include white-cross, which have a white X-shaped cross on the clear, round tops of their bodies, and moon jellies, which have four small, white circles. White-cross and moon jellies grow to roughly the size of a small dinner plate and can have blooms of 1,000 individuals or more. 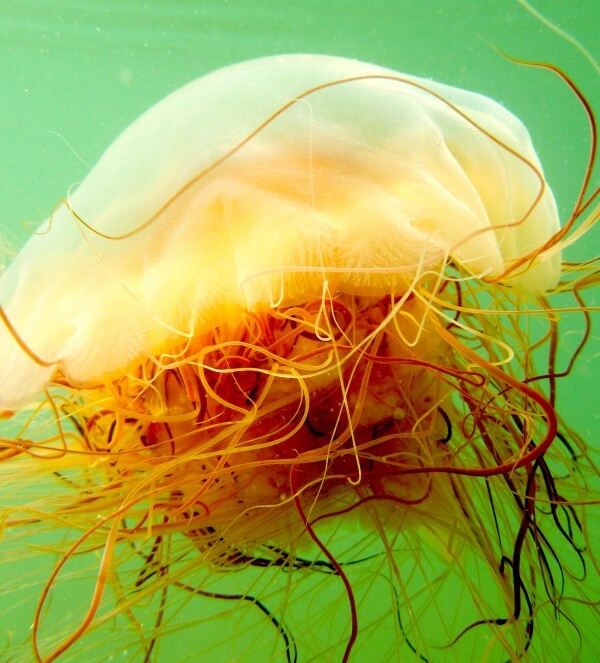 Another type frequently seen here, though in fewer numbers, is the lion’s mane jellyfish, which is larger and has a darker hue and more potent stinging tentacles, Record said. Sea combs — colonial organisms similar to jellyfish that, according to Record, resemble peeled grapes — also are common in Maine. 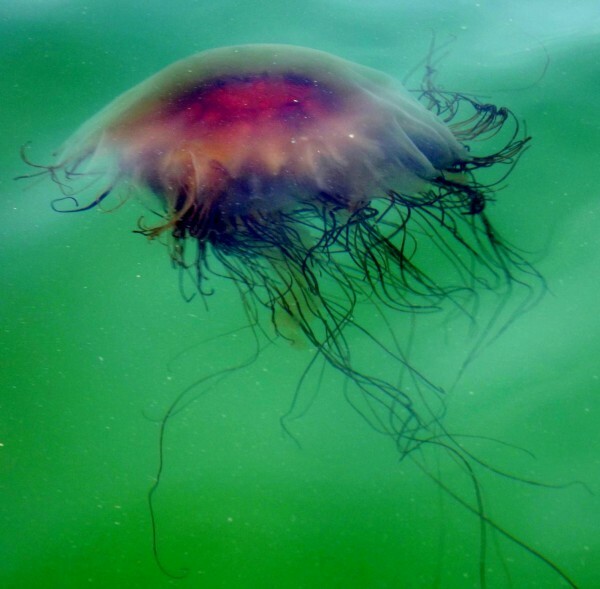 The most poisonous kind of jellies, box jellyfish or Portuguese man o’ war — another type of colonial organism — inhabit warmer waters and have not been reported in Maine, he said. White-cross or moon jellies may cause only mild skin irritation when touched, but they can cause inconveniences in other ways. 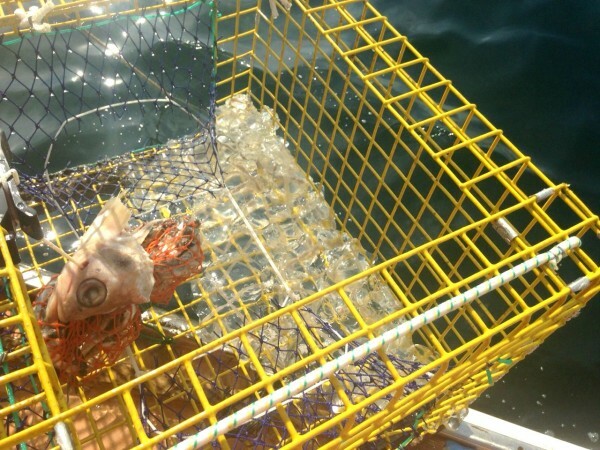 Record cited reports in the Boothbay area of fishermen hauling up several white-cross jellies in their traps, he said, which need to be cleared from their gear. Some fishermen have indicated it is a nuisance, he added, while others have said it is less time-consuming than removing seaweed from their lines and traps. Zoe Weil of Surry is one of the citizens who has contributed to the crowdsourcing effort. While paddleboarding in July off Lubec, Weil saw “at least a hundred” comb jellies and 50 white-cross jellies, and perhaps 20 moon jellies, she added. Record said anyone who wants to submit their photos of jellyfish in Maine can send them by email, along with the time and location the photo was taken, to jellyfish@bigelow.org. They also can post them with the same information on Twitter, either by sending them to his account at @SeascapeScience or by using the #mainejellies hashtag. The information will be compiled in a database that, Record hopes, will generate interest in conducting a scientific jellyfish survey in Maine. Even if it takes a long time to raise the funding for such a survey, he said, the database hopefully would prove useful to marine scientists who one day have the resources to conduct a formal inquiry. Record said that, to this point, there has not been enough funding available to conduct scientific surveys of jellyfish abundance in Maine or sea sampling that might indicate where they are being hatched. Such studies, depending on how thorough they are, could cost up to half a million dollars per year, he added. “But I think even with a sustained citizen reporting system, we can get some really good information,” he said.